Arsenal boss Unai Emery could potentially have a headache on his hands with the club unable to recall Calum Chambers from his loan spell at Fulham when the transfer window reopens. The England international penned a fresh contract extension with the Gunners during the summer but he was thereafter loaned out to the Cottagers in order to earn regular gametime. 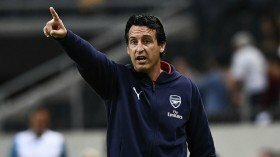 Emery's side have since fared impressively across all competitions but they now find themselves in a fragile situation in the central defence with Rob Holding suffering a long-term knee injury. According to Evening Standard, the Gunners did not include a recall clause into the contract of Chambers and the player has no chance of returning to the team unless Fulham voluntarily terminate the deal. In this case, Shkodran Mustafi and Sokratis Papastathopoulous remain the sole central defensive positions fit for the moment while Laurent Koscielny has yet to earn any competitive action since his return from an Achilles injury. Konstantinos Mavropanos and Nacho Monreal are likely to reduce some of the burden by returning to training this month but their participation during the festive period and beyond depends on them avoiding any setbacks.